Survation on behalf of women’s equality charity The Fawcett Society surveyed over 8,000 UK adults about attitudes to gender issues. The large sample size and interrogation of underlying gender bias is unique and provides a robust picture of the state of British attitudes to gender equality in 2016. A significant majority (83%) of the British public support equality of opportunity for women – this included even higher support from men (86%) than women (81%). Although more women (12%) compared to men (7%) said they don’t know whether they want equality of opportunity, which is a trend in most polls – with men tending to be more assertive about their opinions than women. Three quarters (73%) of the public think equality would benefit the economy, with higher support from women (76%) compared to men (71%). Older people are more supportive of equality than younger generations – Three-quarters (77%) of over 65 year old’s think equality would benefit Britain’s economy compared to 68% of 25-34 year olds. Plus older people are more likely to support equality of opportunity – 88% of over 65s compared to 78% of respondents aged 25-34 want equality. Opinion on gender identity in Britain is split. More than half (56%) think there are two genders – male and female – and less than half (44%) think gender can be a range of identities. 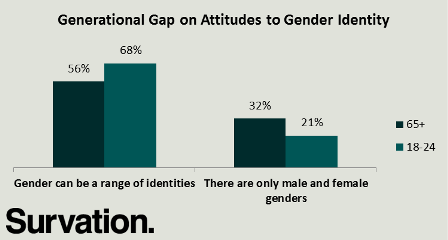 Women take a more fluid view than men – 48% of women think gender can be a range of identities compared to 39% of men. 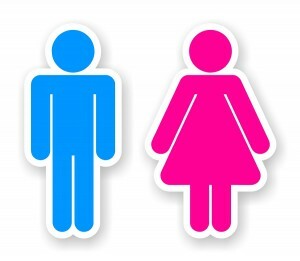 Older people hold more prescriptive views on gender – 65% of over 65s think gender is binary compared to 44% of 18-24 year olds, with both views significantly differing from the 56% national average. 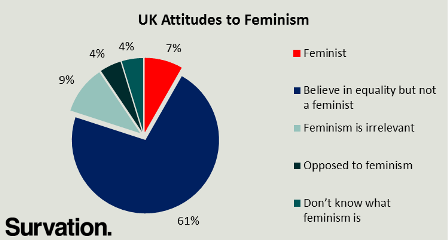 Only one in twenty (4%) people in the UK said they don’t know what feminism stands for. However 3 in 5 (61%) people in Britain believe in equality for women and men but don’t describe themselves as feminist. Only 7% self-identify as feminist and one in ten (9%) think feminism is irrelevant. People who identify as feminist are more likely to think gender can be a range of identities – 68% of feminists think gender is fluid compared to the 44% national average. People who said they are either opposed to feminism or think feminism is irrelevant are less likely to think gender is fluid – 30% of those opposed to feminism and 29% who think feminism is irrelevant stated that gender can be a range of identities – which is well below the 44% UK public opinion average. The word ‘feminism’ triggered various responses – negatives such as ‘overbearing’ were provided by one in four (26%) while positive connotations such as ‘strength’ were given by one in five (22%). The survey included a significant sub-sample of over 1,400 people who make decisions about recruitment and interviewing – an important sub-set of middle-managers who hold the keys to career progression. This group’s responses were conservative compared to the full sample. Compared to the national average, double the amount of ‘decision-makers’ do not want equality of opportunity – 7% compared to 15%. 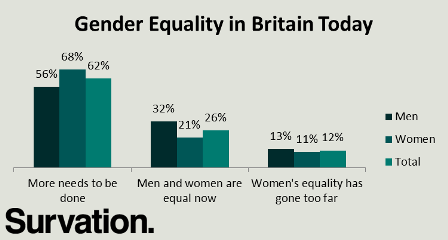 Only half (51%) think more needs to be done for men and women to be equal, compared to the UK average of 62%. Only one in twenty (6%) think they would be personally disadvantaged by gender equality whereas if you are a decision maker in your workplace you are more than twice as likely (14%) to think you’ll be disadvantaged. Survation interviewed 8,165 adults aged 18+ between 30th November – 3rd December 2015. Full tables are available here. Tables for women’s only answers here and men’s only answers here.